When the rare birds from the deepest depths of Germany’s Ruhr Area, Castrop Rauxel to be more precise, signed their first record contract in 2011 with Redfield Records, the band had existed only for about a year. At this time, the self-titled EP had already been thrown on the market and was going to be rereleased by their new label partner. The touring machine was steadily working on almost every weekend and their cheeky performances laid the foundation for later successes. The video for the cover version of Ka (...) Mehr anzeigenty Perry’s “California Gurls” that was produced at that time and has collected almost a million clicks on YouTube up to this day. In March 2012 the much-debated band released their debut album “Bury Me In Vegas” after the single “Is Anyone Up” had already hit like a bomb and has grown to be the band’s top hit. With the release on Redfield Records the album got its decent shape in form of a special bundle along with a foxtail and a manual for wild parties. Later it was also released in Japan via the big label Redtone Music and on the famous metal label Earache Records in the USA and Great Britain. During the following months the concert history got longer and longer. Aside from touring with Callejon or Asking Alexandria, there were also journeys all over the world that became true highlights. 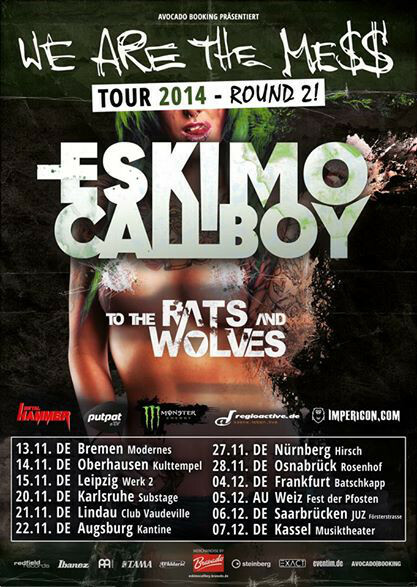 Eskimo Callboy traveled to Russia und saw Eastern-European fans freak out com- pletely. In Japan they were treated like big rock stars on the “Geki Rock Tour Vol. 5” and when their Asia tour took them to China, the six-piece suddenly found itself on the Chinese Wall - a striking experience! But things got even more crazy when Eskimo Callboy were confirmed for the four week long “Fight To Unite Tour” that took them to through the whole of the United States in a mobile home. In the meantime they also found some time to give an interview to the European culture channel arte that called them one of the leading icons of the Generation Y in their TV coverage about them. In Las Vegas, on the last date of the tour, the band lived up to the album title, played a breakneck show and almost missed the plane that took them straight on the next journey, the famous “Full Metal Cruise”. As the only Electro-Core act they entered the decks and stages of the cruiser ship and not even the die-hard metal fans were left cold. In the following months Eskimo Callboy stormed the stages of the main open-air festivals like Open Flair, Reload, Serengeti and many more. At an impressive tent-show on the legendary Wacken Open Air one could even observe the marriage proposal of a fan to his beloved on stage. While the band was already back in the studio in the late summer of 2013, to continue the work on the follow-up to “Bury Me In Vegas”, an invitation to the Metal Hammer Awards was in the mail. The band traveled to Berlin, stumbled over the black carpet and won, completely sur- prised, the acclaimed Metal Hammer Award in the category “Up and Coming”. They took it as the well-deserved salary for the unbelievable last months. There is no pause for Eskimo Callboy, the band doesn’t rest on its laurels. While working on the second album “We Are The Mess” they supported Callejon for another time and played in Belarus, Russia and the Ukraine – this time in sold out venues. While the songs were written all of the six musicians were sure that the growing expectations wouldn’t prevent them from doing anything they want. The band returned to its roots, what only means that they recorded in their own studio with great fun and under the influence of a few drinks. They again conquer every musical border and poach unimpressed in all genres. With their sophomore Eskimo Callboy take another big step forward. Their sound mixes a lot of danceable riffs into a catchy brew, that is garnished with mean breakdowns and deep shouts. From one second to the other the listener is catapulted from the glossy disco dance floor into a sweaty moshpit and a few moments later he finds himself in a nightclub where he gets another shot at the bar.